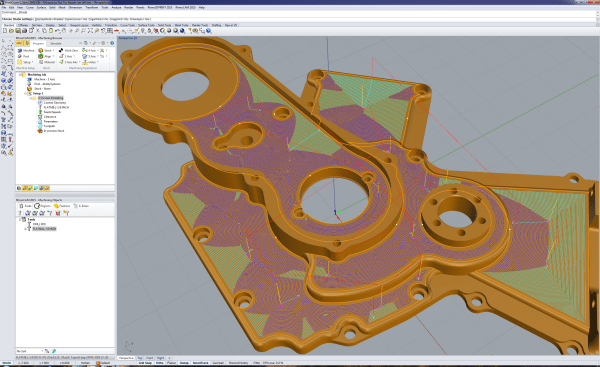 RhinoCAM-MILL is one of the five modules offered in the RhinoCAM CAM software suite. Combining free-form modeling power of Rhino and the legendary machining capabilities of VisualMILL this module offers an easy to use yet powerful milling solution that is ideal for mold, die & tooling, wood working, rapid-prototyping and general machining. RhinoCAM includes 2-1/2, 3, 4 & 5 axis machining functionality. It comes with hundreds of free post-processors and a post-processor generator to create your own. Priced right for the cost conscious buyer, RhinoCAM-MILL CAM software delivers outstanding value for your investment. The RhinoCAM MILL module comes in 5 different configurations to suit the varied machining needs of our customers. This is a general purpose program tailored for hobbyists, makers and students. Ideal for getting started with CAM programming. Includes 2 & 3 axis machining methods. Packed with sufficiently powerful manufacturing methods this easy to use package is not only effective but also attractively priced for the budget conscious or entry level buyer. This module includes the NEST and ART free of cost. This is a general purpose machining program targeted at the general machinist. This product is ideal for the rapid-prototyping, hobby and educational markets where ease of use is a paramount requirement. Includes 2-1/2 Axis, 3 Axis and Drilling machining methods. This module includes the TURN, NEST and ART free of cost. This configuration allows 4th Axis Indexed and continuous roughing and finishing operations to be created. Curve based continuous machining such as 4 Axis Facing, Pocketing, Profiling & Engraving as well as Surface/solids/meshes based machining such as Roughing, Finishing and Curve Projection machining are available. This configuration includes all of the functionality included in the STD configuration. This module includes the TURN, NEST and ART free of cost. This powerful package is ideal for mold, die and tooling, wood working rapid-prototyping and general machining markets. This product boasts of powerful toolpath generation strategies coupled with tools for efficiently controlling the cutting tool for detailed machining capabilities, while not sacrificing ease of use. Suitable for demanding users with sophisticated manufacturing requirements. This product configuration includes all of the functionality included in the EXP configuration described above. This module includes the TURN, NEST and ART free of cost. This package includes our new 5 Axis continuous machining functionality. Suitable for highly sophisticated machining requirements such as aerospace, advanced mold making and woodworking industry, this package includes such machining methods such as surface normal machining, swarf machining and surface flow machining. The package in addition includes all the functionality found in the PRO configuration described above. This module includes the TURN, NEST and ART free of cost.